Studies of election campaigns have shown an increased employment of websites, weblog tools, email, and social media by political campaigners, as well as the use of similar platforms by citizens to find information, communicate about elections or engage more generally in political issues. This comprehensive volume explores the ways in which social media is used on the one hand as a campaigning tool, and on the other, by local citizens. It aims to develop a more holistic and Eurocentric research agenda by capturing both supply and demand practices at the European level. The authors employ both single and multination case studies, furthering debates on how political actors and voters embrace the new information and communication environment, in what ways, and for what purposes. 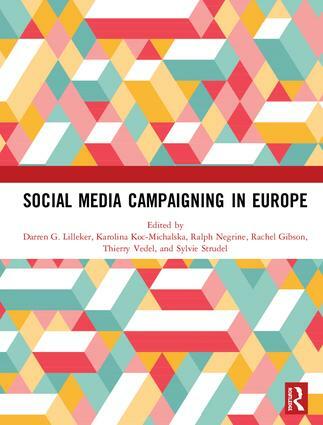 The book offers new perspectives on social media campaigning within European democracies, thereby contributing to a more global and comprehensive understanding of how campaigning is affected, and might be enhanced, by developing an interactive digital strategy. This book will be of great interest to students of both politics and media studies. It was originally published as a special issue of the Journal of Information Technology & Politics. Darren G. Lilleker is Associate Professor in Political Communication in the Faculty of Media and Communication at Bournemouth University, UK. His research focuses on the nexus between political campaigns and voter engagement, trust, and self-efficacy as conceptualized in his book Political Communication and Cognition (2014). Karolina Koc-Michalska is Associate Professor at Audencia Business School and Associated Researcher at CEVIPOF Sciences-Po Paris, France. Her research focuses on the strategies of political actors in the online environment and citizens’ political engagement, where she employs comparative approach focusing on the U.S. and European countries. Ralph Negrine is Emeritus Professor of Political Communication in the Department of Journalism Studies at the University of Sheffield, UK. His publications include The Transformation of Political Communication (2008) and The Political Communication Reader (with James Stanyer, 2007). Rachel Gibson is Professor of Politics at the University of Manchester, UK. Her research focuses on how digital technologies are changing the way in which election campaigns are fought and won. She is interested in comparative research and has a particular focus on developments in the UK, the U.S., Australia, and France. Thierry Vedel is a CNRS Senior Research Fellow with the Center for Political Research at Sciences-Po Paris, France. Sylvie Strudel is Professor of the Political Sciences (Professeur des Universités) at Pantheon-Assas University, France, and Associated Researcher at Centre Marc Bloch de Berlin, Germany, and CEVIPOF Sciences-Po Paris, France.